Wydad Casablanca, Al Hilal, Esperance and Cotonsport of Cameroon collected precious away points as the group phase of Champions League kicked off. Wydad scored one minute from full-time to force a 3-3 deadlock against Al Ahly of Egypt in an empty Cairo stadium. Sudanese side Al Hilal held two-time winners Enyimba 2-2 in their Group A match in Nigeria on Sunday. Ten-man Cotonsport forced a 0-0 draw away to Raja Casablanca of Morocco in the other Group A played on Saturday. 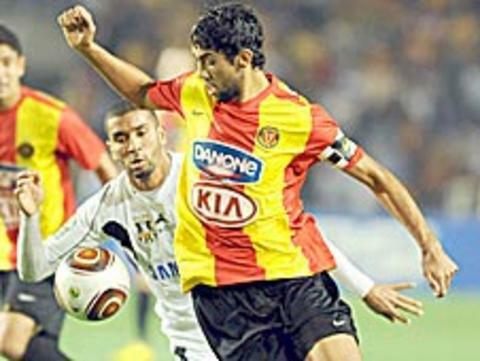 The Tunisian side Esperance managed to draw 1-1 with Mouloudia Alger of Algeria in Group B also on Saturday. Millions of Egyptians had to watch their team Ahly on television as they played behind closed doors because of a ban following the crowd trouble in a qualifier against Zesco United of Zambia. It came as no surprise without their voiceferous fans as Ahly fell behind in less than a minute of their clash against the Moroccans. Sherif Abdul-Fadil was guilty as he conceded an own goal by misjudging a cross. Experienced goal poacher Emad Moteab quickly levelled after being set up by fellow striker Dominique da Silva and long-serving defender Wael Gomaa converted a penalty midway through the first half to give Ahly a 2-1 half-time advantage. Mouhssine Iajour raised his goal tally in the competition this year to four with an equaliser just past the hour mark as the traditionally stingy Ahly defenders were caught napping again. Mauritanian Da Silva nudged the Cairo 'Red Devils' back in front with 14 minutes left after running on to a pass from former Tottenham Hotspur midfielder Hossam Ghaly, rounding goalkeeper Nadir Lamyaghri and stroking the ball into an unguarded net. Hilal's Zimbabwean striker Edward Sadomba scored twice in the game in Aba to help the visitors secure the vital away point. He broke the deadlock of the game on 22 minutes but the home side restored parity in the 49th minute thanks to an effort by defender Valentine Nwaebili. Uche Kalu put Enyimba in the lead on the hour mark but Sadomba struck ni the 77th minute to seal the draw for Hilal. Cameroonian side Cotonsport secured their draw result despite missing three key players who are suspended. Cotonsport overcame the absence of three suspended stars and having a player red-carded 13 minutes from full-time to force the draw in Casablanca. Midfielder Oussama Darragi gave Esperance an early lead in a clash of former title holders and defender Mohamed Meghirbi levelled nine minutes later. Esperance, who have won all the Pan-African competitions except the Confederation Cup, lived up to expectations that they will reach the semi-finals from Group B along with Al Ahly of Egypt who play Wydad Casablanca of Morocco on Sunday. Darragi ranks among the best young midfielders on the continent, having already made numerous appearances for Tunisia at senior level, and it came as no surprise that he scored in Algiers given his fondness for goals. Mouloudia conquered Africa 35 years ago after wiping out a three-goal, first-leg lead built by Hafia in Guinea, but the current squad does not appear capable of bringing the trophy back to the North African country. They dodged relegation from the national league by a solitary point after forcing a last-round goalless draw on the road and faced Esperance soon after coach Noureddine Zekri quit. After scoring eight goals at home to oust Real Bangui of Central African Republic, Dynamos of Zimbabwe and InterClube of Angola in qualifiers, they struggled to create openings against the 1994 African champions. A Cotonsport side coached by Frenchman Denis Lavagne will be thrilled to take a point home from Morocco as they appeared weaker than Raja, Enyimba or Hilal and were depleted by Ndzana Kana, Mbongo Ewangue and Lassina Karim not being available. It was the first time since the African Champions League was revamped 14 years ago that all four opening-round games were drawn. The results suggest fierce mini-league competition in the hunt for the $1.5m first prize.